Adding a granny annex to your home can be beneficial for both the home owner and also the member of family who is going to live in the house extension. When thinking about adding an extension to your home for a member of your family try to decide what will be the best design. Most annexes will have the minimum of a bathroom or shower room, a living area, a kitchen area and one bedroom. Depending on the size available for the annex some kitchens are part of the living area as well. Also consider how this will affect the remaining garden of the house and whether the person living in the annex will have use of the garden area. Visit a few homes that have a granny annex or separate flat to gain ideas for your own build. Try to obtain the best room layout possible. Consider that the person living in the annex may become infirm, need a wheelchair or other aids to live independently and design the annex accordingly. A kitchen separate to the living area is preferable as are two bedrooms so the person living there can have space for a visitor. A separate entrance to the granny annex is a good idea as the person living there can live independently. However an internal door would be a good idea as the home owner can gain access into the extension in an emergency. If the rooms were to be let the homeowner could enter easily to clean the rooms without having to go outside to the main door. The door could be locked at other times for security. You will need planning permission for the addition of a granny annex. Speak to your local planning office about your idea before hiring an architect to draw up plans. You may glean some information that can help you in your design. By attaching a granny annex onto your home you could be assisting an older family member to downsize their life. You may come to a financial arrangement whereby the family member provides the finance for the build from the sale of their own property. Whatever the arrangement check that this is agreeable to all members of the family who may have benefited from the older person’s estate when they die. Family arguments over money are very common and if it was thought that one person had gained over another it could cause resentment for years to come. You may need finance to build the extension. As the value of your home would be increased with the addition of a granny annex there should not be too much objection to the loan as long as you can show that you can meet the monthly repayments. 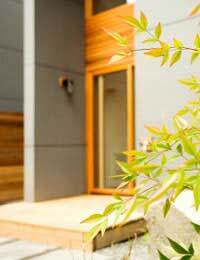 If you are building the annex to earn an income from your home make sure that you back up your application with evidence of the income versus the cost of the build. There may come a time when the granny annex is not needed for a relative and could easily become an area for storage or left empty. Why not consider letting it out to earn an income from your home? You could rent the annex as a holiday let if you live in an area that attracts tourists. The annex could also be used as a base for holiday makers that are touring the area.Alternatively it is possible to rent the annex out to a single person or a couple on a longer basis as living accommodation. Check with your local council and also your mortgage provider that it is permissible to let your granny annex out to people that are not members of your family. This could affect your council tax grading as part of the building could technically be thought of as a business once you earn a regular income from it. You may also have to pay tax on the income. hya, at a very young 54,with a grown family and gorgeous grankids whom,like me are on low income,seeing single-parent struggle of my daughter trying to work juggle mommy life etc and me with "unbelievable"health issues,having already done the "struggle"of a single working mom forces me into thinking we could be a lot more help to each other by me living in a self contained bedsit/garden flat adjoined to her council home that she" loves",she is more than happy with the idea of having mammy close,although she has intimated I stay away when she on single girl duty! !im more than happy to do so !!! !as I hope she too will have same respect reciprocated! !,facts its a council home,it has its own entrance ,plumbing,sink toilet,space,altho this is at such an embryotic stage but I would love it done for xmas oh yes as a surprise for us off santa would be fab>???????? ?I love reclamation ,junk ,bootsales n charity shops and altho my daughter are different we are also very alike so need our own space.xthe kids I know will want a jack n jill door and woodland theme,with the odd super-hero,and drama thrown in for good measure.